This is a grammar point that had me in a lot of confusion recently. I’d created some lessons to help people on the Memrise group learn these but due to conflicting information on the internet the course got very jumbled and had to be corrected a number of times. I’ve finally pinned down these grammar points after checking with native Japanese people. Apologies to those who have been using Memrise and gotten confused on these points. I hope the following helps. 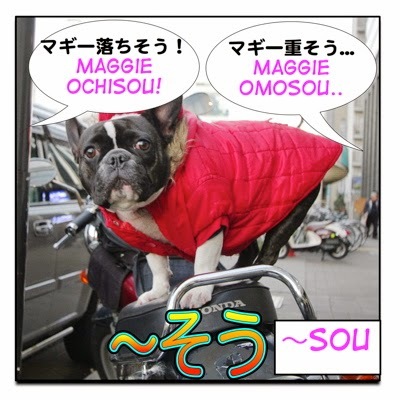 The following are all the uses for sou そう for “It seems” and “I heard”. If you have any further questions feel free to ask in the comments. You can practice the following grammar on Memrise in lessons 8 & 9 in the Beginners Japanese Grammar 2 course. “I heard” is used when you hear something from someone, such as a friend or the news, and then tell someone else about it. Dictionary form + そう is used when describing something that will happen. Such as “I heard it will rain today” would be きょうはあめがふるそうです. Past tense + そう is used when describing something that has happened. Such as “I heard it rained today” which would be きょうはあめがふったそうです. “It seems” is used when you’re judging something based on your own conclusions. Such as looking out of the window and thinking “oh it seems like it’s going to rain” which would be あめがふりそうです. い-Adj – そう　<- The い gets dropped! EXCEPTION: Don’t say かわいいそう (かわいい is a な-Adj), you would say かわいいらしい. « Apologies, Updates, Changes and Plans!